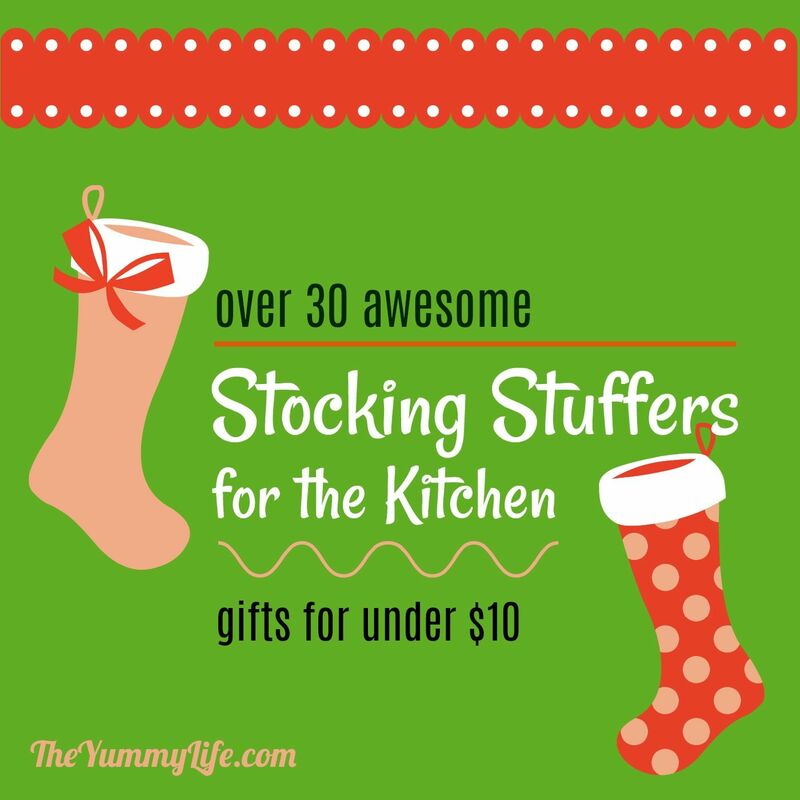 Here are my top 30+ kitchen stocking stuffer recommendations. (My list has grown from 15 to over 30 since I first compiled this list.) 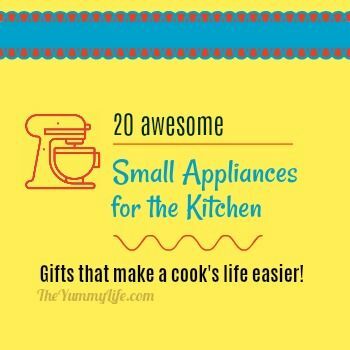 These little gifts are all affordable and tried-and-true in my kitchen. 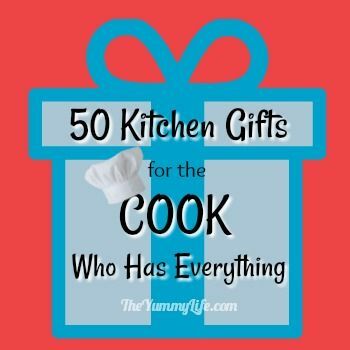 Many are unique enough to make great gifts for cooks who already have well-stocked kitchens. In this post, I'm sharing a brief description of each item along with Amazon links in case you'd like to read the reviews or make a purchase. Several of my top 30 picks are also recommended by Cooks Illustrated's Test Kitchen -- a source that I often consult when making purchases for my kitchen. They all have strong Amazon reviews, too. You may want to use these ideas for making your own Wish List or for gift ideas for others. They're small enough to be particularly suitable for filling those holiday stockings or giving as host/hostess gifts. It's also fun to bundle several of these together in a basket for a wedding shower or birthday gift. 1. Recipe Rock (view on Amazon). 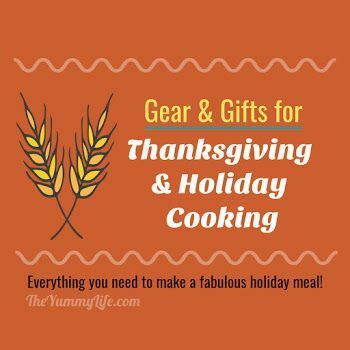 This has a strong magnet that holds magazine sheets, printed recipes or recipe cards in place. It's small enough to fit in tight spaces on the counter. I bought mine based on strong Amazon reviews, and it's now become one of my favorite little gifts to give. It comes in a variety of fun colors. 2. Mini Silicone Pinch Bowls (view on Amazon). This set of 4 miniature pinch bowls makes is to easy to funnel ingredients as you cook. They're ideal for holding chopped herbs, spices, sauces, or condiments. 3. Easy Jar Opener (view on Amazon). If you've ever struggled to remove a stubborn jar lid--no more! This cleverly designed gadget makes it fast and easy. It comes with a base pad that keeps the jar in place, reducing the force required to open the jar. Even my 80-year-old mother uses it! 4. Jalapeno E-Z Corer (view on Amazon). This is a pretty specialized tool, but it's very handy to have if you cook with jalapenos often. Cut off the stem end of the pepper, and this tool effortlessly cleans out the membrane and seeds inside without your hands coming in contact with their hotness. 5. Compact Egg, Strawberry, & Mushroom Slicer (view on Amazon). This economy-priced tool perfectly slices a boiled egg, strawberry, or mushroom in one quick motion. It's easy and safe enough for kids to use it. 6. Decorating Squirt Bottle (view on Amazon). This is so handy for cookie decorating and drizzling melted chocolate. Simply squeeze to dispense the icing, making it easy for all ages to use. A wide mouth makes it easy to fill and clean. It comes with one decorating tip and will hold other standard size decorating tips (like Wilton tips). 7. Kitchen Shears (view on Amazon). These are simply amazing scissors, especially with their low price tag. You can use them to cut a chicken apart in no time, yet they can also be used for cutting delicate herbs. They are so versatile and one of the most frequently used tools in my kitchen. 8. Easy Knife Sharpener (view on Amazon). This received a "best buy" recommendation from Cooks Illustrated's test kitchen. It makes a great, affordable gift. It is so easy to use and it sharpens knives quickly, easily, and accurately. 9. Y-Peeler (view on Amazon). I recently purchased this peeler, and WOW, it is so much better than my old swivel one. This "Y" design is comfortable to hold and easy to use. And, boy can this baby peel a potato with ease. It's another well-engineered product by Oxo. 10. Rabbit Wine & Beverage Bottle Stoppers (view on Amazon). This is a set of 4 stoppers that fit a variety of bottle sizes to provide an air-tight seal to prolong and preserve opened bottles of wine, champagne, soda, oil, and vinegar. These are easy to insert and remove, and they're dishwasher safe, too. I've tried lots of bottle stoppers, and these are my favorite. 11. Utensil Pot Clip (view on Amazon). This attaches to the rim of a pan and holds a spoon or spatula in place so it's handy for giving the pot a quick stir. Any drips from the spoon fall directly into the pot, so there's no mess from resting a spoon on the stove or counter. I have 2 of these, for when I'm cooking 2 things on my stove. It keeps the right spoon with the right pot. This is such a useful, unique little gift. 12. Nesting Mini Measuring Beakers (view on Amazon). These are ideal for measuring small amounts of liquids like juice, extracts, oils...even medicines! The set includes 2-ounce, 1-ounce, 1 T and 1 tsp beakers that nest compactly for easy storage. 13. Strawberry Huller (view on Amazon). This Amazon best seller has a little claw that opens and closes to quickly, easily, and precisely remove a strawberry stem. It can also be used to core small tomatoes. 14. Silicone Egg & Pancake Ring Mold (view on Amazon). This 2 piece set of molds make it so easy to cook a perfectly round egg--they're an ideal size for egg sandwiches like my Healthy Egg McMuffin Copycats. They truly are non-stick; the eggs release easily every time. 15. Silicone Pastry Brush (view on Amazon). I use this for brushing the turkey with olive oil (or melted butter) and prefer it over one with natural bristles. It's heat tolerant and is dishwasher safe. 16. Porcelain Reusable Place Card and Food Labels (view on Amazon). Use these attractive, handy mini signs to label food on a buffet table. Or, add names to use them as place cards. A dry-erase marker is included. These make a great host/hostess gift, too. 17. Mason Jar Pouring Cap (view on Amazon). These flip-top, leakproof lids make it easy to pour directly from mason jars. I use these on half-gallon jars of iced tea, cider, and sangria. The hole allows the liquid to flow, but filters out the tea bags or fruit inside the jar. They come in a variety of colors in both regular- and wide-mouth sizes. 18. Measurements Magnet (view on Amazon). I keep this handy little stainless steel chart on my fridge for easy reference. It has cup, ounce, tablespoon, teaspoon and milliliter equivalents. 19. Mini Whisks (view on Amazon). These are the perfect size for whisking an egg or small amounts of sauces and mixtures. 20. Drink Muddler and Mixing Spoon (view on Amazon). These are handy bartender's tools for mashing fruits and herbs in the bottom of glasses. I also use a muddler for making naturally fruit flavored waters. 21. Bamboo Spoons (view on Amazon). This set of 6 spoons is such a great value. I switched from regular wood to bamboo spoons years ago. They hold up better and are eco-friendly. These can be used on non-stick surfaces, too. You can divide this set up over several stockings, if you like. 22. Melon Baller (view on Amazon). This easy-to-use tool by Oxo is perfect for scooping ball shapes for fruit salads, garnishes, desserts and more. 23. Mini Spatulas. (view on Amazon). These are so handy for cleaning out jars and stirring small mixtures. 24. Mini Tongs (view on Amazon). These little tongs are the perfect size for appetizers and removing olives and pickles from jars. 25. Herb, Kale, and Swiss Chard Stripper (view on Amazon). With this simple gadget, it only takes seconds to strip kale, collards, chard and herb leaves from stems. 26. 5-in-1 Jar and Bottle Opener (view on Amazon). I reach for this tool every day. I never have to struggle to open a tightly sealed jar or bottle. This tool does it all. 27. Garlic Peeler (view on Amazon). This makes it a breeze to peel garlic. Simply place the cloves inside the tube, press and roll with your palm, and the skins fall right off. This set of two is a great value. 28. Flip-top Bottle Pourers (view on Amazon). I use these on bottles of oil so it's easy to dispense them when I'm cooking. The flip-top covers keep the contents clean. These also work well on liquor bottles. 29. Small Citrus Juicer (view on Amazon). This little juicer is simple but effective for juicing both lemons and limes. The container has measurement marks, so you know when you have squeezed the amount of juice you need. 30. Measuring Spoons (view on Amazon). In my opinion, you can't have too many measuring spoons! Especially when I'm doing a lot of cooking, I like having multiple sets so I don't have to stop and wash them between measurements. These are good quality at a great price. I also like the long, narrow shape of the spoons so they can fit easily inside of spice bottles. 31. Pie Crust Maker Bag (view on Amazon). If you've ever struggled with rolling out an even, round pie crust and transferring it to the pie plate, this totally solves those problems. It works with amazing ease. This bag can be rolled up and tied with a ribbon for insertion into a stocking. A must-have for any pie maker or wannabee pie maker. 32. Oven Monitoring Thermometer (view on Amazon). Does your oven heat hotter or colder than where you set it? Or, maybe you don't know for sure. This awesome thermometer displays your true oven temperature so that you can make any needed adjustments for accurate cooking. I check my oven with this periodically to make sure it's heating accurately. Those are 30+ of my favorite stocking stuffer gifts. Their compact size and low price make them right for any time you need a little something to give.